that you can apply to your home. SunTex Solar Screens will lower your energy bill by stopping the heat transfer through your windows and doors while still maintaining your view. 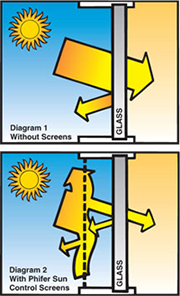 Solar Screens are full length screens that cover the entire glass of your windows and doors. Phifer Suntex is a fabric woven of extremely strong and durable vinyl-coated polyester yarns. The uniform weave design offers excellent outward visibility and good ventilation. Shading is approximately 80 - 90 %, and SunTex is available in a choice of four earth tone colors. The fabric is also pet resistant making it ideal for use in doors and full-length screen panels. We use a true 5/16” x 1” dimensional .024 frame. Our frames are the strongest roll form aluminum frame available on the market. This frame is produced by Aluminum Screen Manufacturing, an industry leader in aluminum roll form frames. It is designed specifically for Solar Screens. SunTex 80 and SunTex 90 are also available in the colors shown below. Protect your furnishings from the harmful sun rays. Protection from those pesky insects. Durable alternative to insect screen material. Accentuates the beauty of a home. Blocks the sun...not the view.